Out Of Office » Blog Archive » Do You Need a Change of Scenery? He said it was so successful that he’s planning to do it again every quarter. 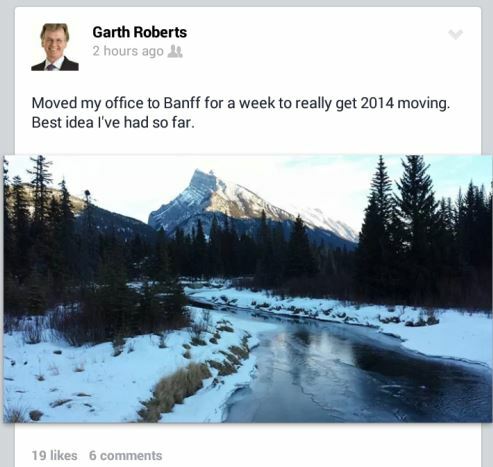 And he’s inspired me to go away for a similar trip (not as far as Banff, though!) to do some solid writing on my next book. What can you do to get into the right mindset for something important? This is one of the big benefits of the Out of Office work style. So create the opportunity if you can! This entry was posted on Thursday, August 7th, 2014 at 12:51 pm and is filed under Embrace the World. You can follow any responses to this entry through the RSS 2.0 feed. You can leave a response, or trackback from your own site.